Just as marketing has moved digital, so has sales. You’re no longer making “house-calls” and rarely have in-person meetings, because the tools available now, make it possible to communicate and sell globally. As our sales environment becomes more internationalized, and dives further into the digital space, it’s not surprising that more and more software tools are popping up to help make our jobs easier. 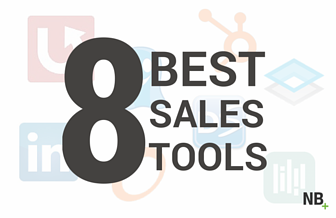 But with the plethora of tools available to salespeople today, it’s easy to get a little overwhelmed. You may be wondering, what plugin will I use to help me manage my email? How can I get better insights from my CRM system? What tool will help me be faster and more efficient? How can I keep track of my deals? Trust me, the list of questions goes on, but rather than continuing to make you think (and perhaps even stress) about the ways in which you can become even better at your job, we’ve pulled together a list of our favorite software tools that will increase your sales efficiency. We’ve not only taken the tools that my sales team uses on a daily basis, but we’ve also talked to others in the software business who use these tools to increase their own sales efficiency. Sidekick (formerly Signals) is a Google Chrome extension developed by our friends over at HubSpot and we can attest it’s a game changer. Not only do you get valuable information about your email contacts right inside your inbox, but you can also see their company profile and track your email activity (like who opens and clicks on them). The company profiles can be particularly helpful as it shows you the company's location, the number of employees they have, their annual revenue, key contacts within the company, and even companies who are similar that you might want to consider prospecting. One of my sales team’s favorite features is how Sidekick integrates with the new HubSpot CRM (which we’ll talk about next). With just one click of the mouse, you can add your contacts into your CRM and all your data entry work will be done for you. It scrapes the info out of Sidekick and populates the fields within the contact’s profile inside your CRM. My team has already shared a few recaps of the HubSpot CRM (you can read one here and another here), so I don’t need to go into full details, but it is certainly a platform we are using to increase our sales efficiency. We have seen that it has helped cut down on data entry time, freeing up my reps to spend more time focusing on preparing for meetings and nurturing their leads. What we like about the HubSpot CRM is that it’s designed with the reps in mind. The industry leader, Salesforce.com, is more designed for the Sales VP or someone on the executive team, and actually ends up costing reps a lot of time in the sales process. We have been making the switch for our reps to start using the HubSpot CRM and they appreciate the time is has freed up and have found their days to be more productive. While the HubSpot CRM isn’t available to all customers yet, it will be in the coming months, so make sure to keep an eye out. We will surely share the news when it’s live, so you can follow us on Twitter as that’s the platform where we share news stories such as this. Many of our customers do still use Salesforce.com as their primary CRM. As I mentioned above, we use Salesforce.com for our executive team as we have found tremendous value in the data and reporting we can pull from it. However, I will say, the platform can be a little clunky and hard to use, which is where our next favorite sales platform comes into play. InsightSquared is, “the #1 Salesforce Analytics app for data-driven business executives and their teams”, and that statement could not be more true. It has transformed the way my team can analyze and react to our sales and pipeline data. With InsightSquared, we have comprehensive pipeline management, better forecasting capabilities, analytics into our campaigns, clear financial reporting and even easy to read dashboards I can share with my executive team. While some may tell you that prospecting is no longer needed in today’s world of inbound marketing, I still like to have tools for my sales team to use in case the time does arise where they have a few spare minutes they could spend on sourcing leads. We often turn to LinkedIn because we know that many of our ideal customers use LinkedIn to connect with other professionals in their industries. While of course, the platform is a fantastic networking tool, it can also be a very helpful prospecting tool. With LinkedIn Advanced Search you can get very granular in the type of people you are targeting - by industry, by title, by geographic area, by company, etc. And if you have a premium account with LinkedIn, which can be a worthwhile investment for a company that does prospect fairly regularly, you can send those folks an email, introduce yourself and hopefully start a conversation about how your offering can be a solution for them. Sales can involve a lot of back and forth, especially when you’re in the contract stage of business. When you’re selling a software or other products, there are often legal teams involved, various signatures required and it takes time. Lots of time. Wouldn’t it be great if you could make that process more efficient? That’s where DocuSign comes in. DocuSign lets you sign documents electronically anywhere in the world, from any device. But more than just that, DocuSign also lets you easily send those documents for electronic signature in just minutes. It’s secure, highly customizable and easily adopt into any organization. If you asked any sales rep what one of their biggest challenges is, I’d guess that many times it’s booking meetings. As a sales professional, you know how difficult it can be to schedule meetings with prospects, the amount of time you spend going back trying to find a time that works for you as well as their time, and how quickly your calendar can fill up. Rather than spending valuable time going back in forth in email trying to coordinate a time to meet, we use a tool called YouCanBook.Me that allows your prospects to book meetings right into your calendar. The platform syncs up with your calendar and when you send out your YouCanBook.Me link, they see the time slots that are available on your calendar. They can then pick a time that works on their end, and the calendar will send out an invite and automatically sync up with your calendar. It saves a tremendous amount of time, and ultimately makes your prospects’ lives easier as well. Whether you’re selling a SaaS based product or services that help someone leverage a SaaS based product, it’s always helpful to know what sort of software your prospect is using. The next software platform comes especially in handy when the software you are selling is web-based and run on the back end of a website. Ghostery is a browser based app that lets you see what software or programs a company is running on their website. Designed for the end consumer, Ghostery lets you block certain apps or programs from running on a website for a variety of reasons, however we like to use it to check out what prospects are using. This insight not only helps us tailor the conversation, but it shows us how sophisticated or knowledgeable our prospect will be on the offering that we are discussing. Rebump is a free app you can add to Gmail which sends friendly follow-up messages to your email recipients, without you having to set a reminder. The automated emails are customizable and look like they are sent directly from your own personal email. And what’s better is you can also track and analyze all the follow-ups you send with Rebump to help you tweak and improve your response rates.